Must be used with GMS K-member. Granatelli's Front Lower Tubular Control Arms will drastically improve the handling/steering response of your Mustang. Reduce under-steer and the 'slop' feel feedback. A great option for the racing enthusiast, these A-arms will eliminate up to 15 pounds from a front end. Some applications will require pairing with coil over conversion where spring perches are not applicable. 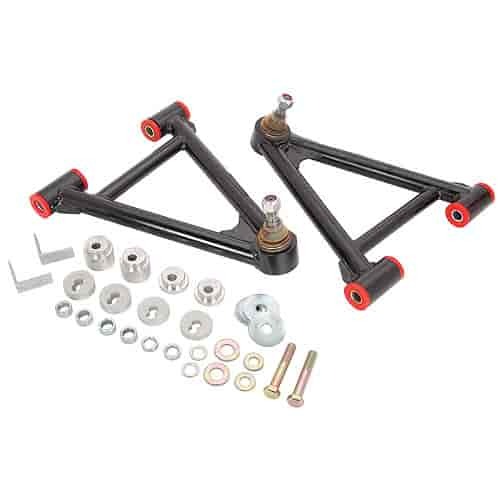 Features powdercoated finish and available with or without sway bar mounts. Does Granatelli GMTA9498NS fit your vehicle? Will these work with an AJE k member? Yes, these will work with an AJE k member.